This lovely ground-level home is located 10 minutes away from the region's most beautiful beaches. 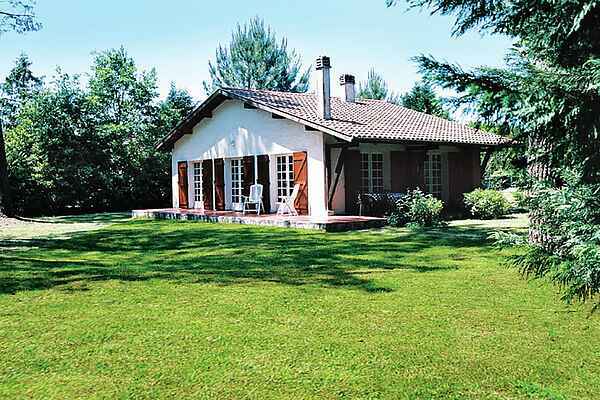 It's situated on the edge of a neighbourhood of villas surrounded by maritime pines: a landscape typical of Landes. The large garden (1250 m2) surrounding the house is ideal for a match of football or bocce ball. The house features a large semi-covered terrace with garden furniture and loungers. Lake Leon, where you can go swimming in complete peace, is located 900 metres away. If you prefer the ocean and gorgeous waves, go 10 minutes by car and you'll be standing in fine sand! From your house, you can go on beautiful walks or bike rides through the forest. Bike paths start 1 km away from the bike rental and can take you places. Go ahead and take a trip to the magnificent nature reserve of Courant d'Huchet, located a few hundred kilometres away. For other activities, there's a mini golf and a pool along the shores of Lake Leon, as well as a bakery and restaurant in Vielle-Saint-Girons (800 m). A gorgeous 18-hole golf course is located in Moliets (14 km). You can also rent bicycles or do your daily shopping in Leon (4 km).